JConcepts Double Dees green compound, black wheels for SC10 rear Rims/Tires Discounts Apply ! JCI30433220 - JConcepts Double Dees green compound, black wheels for SC10 rear Rims/Tires. 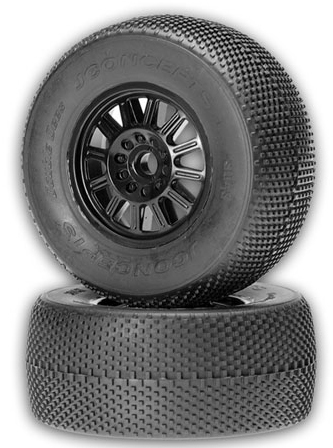 The JConcepts Double Dees tire is perfect for a variety of track surfaces. Wear is always the trade off when going to a small pin tire and with the Double Dees for Short Course, these worries have been minimized. Running qualifiers and main events on the same high performance tire is now possible. The Double Dees design is a world leading tire combination right out of the package, the unique technology combined with the sticky Super Soft compound allow the flexibility necessary to compete on even the most demanding surfaces for an extended period of time. Available in Super Soft Green compound the Double Dees for Short Course are a specialty tire that when matched to the appropriate track can provide the performance that racers dream of. Additionally, the Double Dees include precisely molded Force-1 inserts which fill and proportion the tire specifically between tire and wheel dimensions. Double Dees excel on indoor and outdoor hard packed surfaces with either dry or wet conditions. Drivers will feel the immediate impact of the exclusive design and proprietary rubber compound as they rip around the track at blistering speeds.